Okay. 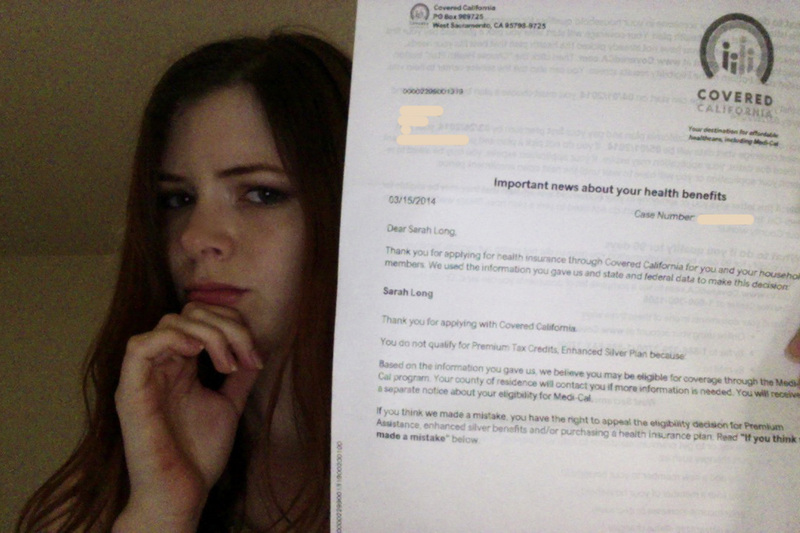 So other Americans might to have to pay for my insurance because I’m too poor. I don’t like that idea, because honestly I never agreed with government-mandated insurance and I don’t want to eat up another person’s hard-earned money, but it looks like I don’t have a say in the matter. 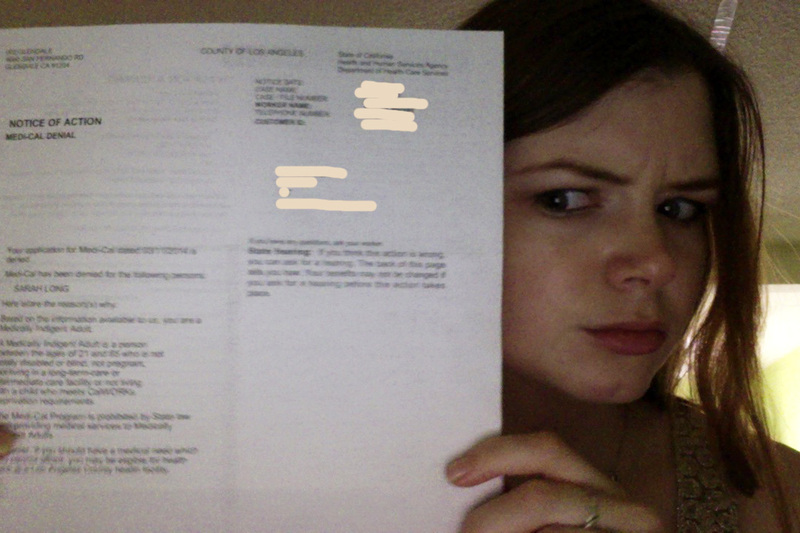 I guess I’ll wait for that letter from Medi-Cal. 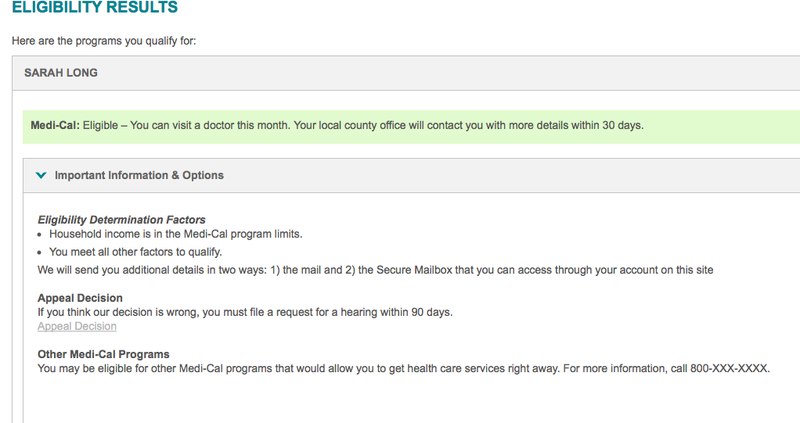 Note my apparent Medi-Cal Eligibility. And that “Appeal Decision” link you see? Doesn’t work. Today I finally had a chance to contact someone during work hours. My phone battery was low and I was too lazy to move my life over to the couch where it was charging, so I decided to try their newfangled “Live Chat” option. And this is where things began to get quite nasty (on my end, at least). Now, I have to admit I’ve been quite the bitter tomato lately, what with the layoff from my dream editing job. I’ve been desperately searching for work, and for months, nothing has panned out. I would love to have her cushy government job — angry customers and all. Anyway, I closed my eyes for ten seconds, did a few Buddhist “Oms” and regained my composure just enough to type an answer. So apparently I don’t know the basics of me. I signed out, got up and grabbed my phone. After some finagling (Press 1 for English! Press 2 for questions about your policy! Press 1 for English again, just in case Russian became your mother language in the 20 seconds since we last asked! ), I got on the line with a guy who sounded like he knew what he was talking about (finally!). I explained the situation, and he knew exactly what was going on. Apparently there are (new!) glitches in the Covered California system. This past week, Medi-Cal computers began their inevitable uprise against their Creators and automatically sent out rejection letters across California. I was apparently a victim. Anyone else in California (or the rest of the U.S. for that matter) having issues with the new system? How does everyone who is currently covered feel about the new insurance plans?